Surveys allow many questions to be compiled into one activity. Our integrated survey builder contains over 30 question types and advanced logic capabilities. We utilize 7 types of logic, advanced multimedia capabilities, image zoom, heatmap, & hotspot. 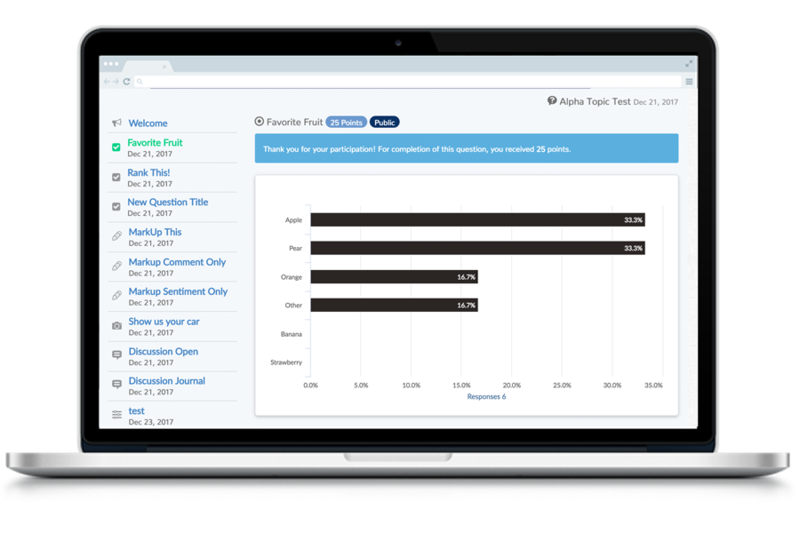 Survey results can be seen in real-time in the Live Report section of the platform. We also allow for multiple survey collection methods, enabling the researcher to invite non-community members to participate in any survey. Polls are an easy way to gain immediate feedback from your consumers. Quick Polls provide one question feedback, while Battle Polls are a more interactive experience where members can decide between two options that are “battling” to win the most votes. 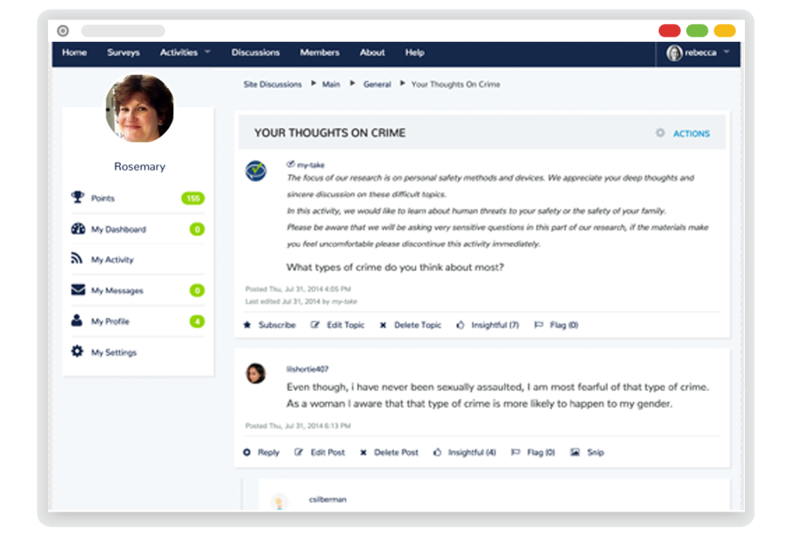 Our integrated Discussion Board allows members to answer a question in their own words, as well as read and respond to other members’ responses. Our searchable Discussion Boards can be divided into subcategories and offer complete control of which members participate. Members can subscribe to a topic to receive notifications. Discussions help strengthen a sense of community in the platform and allow for unexpected, insightful, and unique responses. 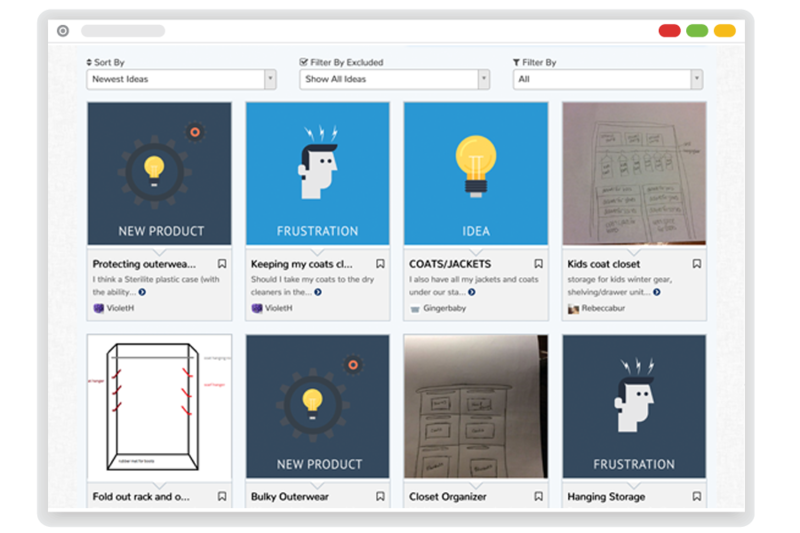 In an Idea Session, members are asked to create, rate, and refine their own ideas and the ideas of others. Results of the idea ratings are visualized in a chart. The top ideas are ranked by each of their individual scores. Idea Sessions allow members to exercise a greater degree of creativity than most activity types, as well as create an opportunity for interaction within the community. 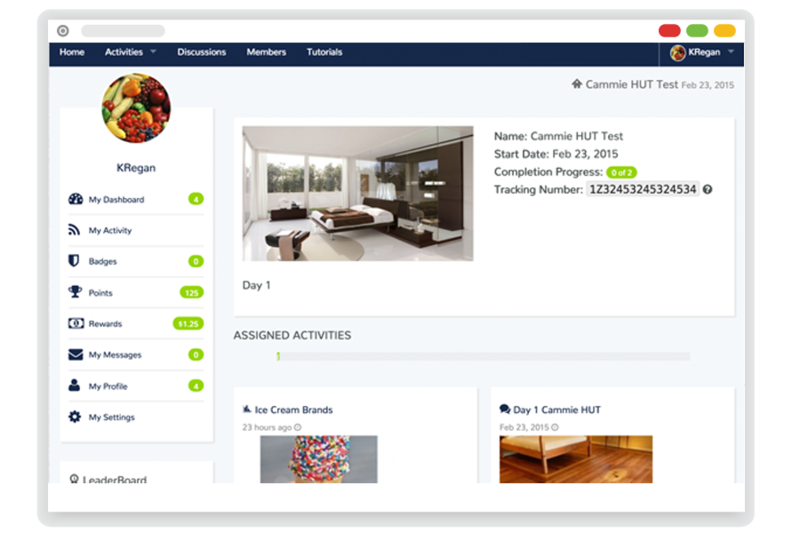 Home Activities, or Home Use Tests (HUTs), are made up of a select number of respondents who test a current or potential product. Activities, most often Surveys, are scheduled throughout the HUT in order to examine how the product is being used, what is liked or disliked, and if the overall perception of the product changes based on the length of use. Chat Sessions are a perfect opportunity for members to take a conversation in a direction we might not have initiated otherwise. In these sessions, members enter a live virtual chat room and are posed an initial question by a member of the My-Take team. 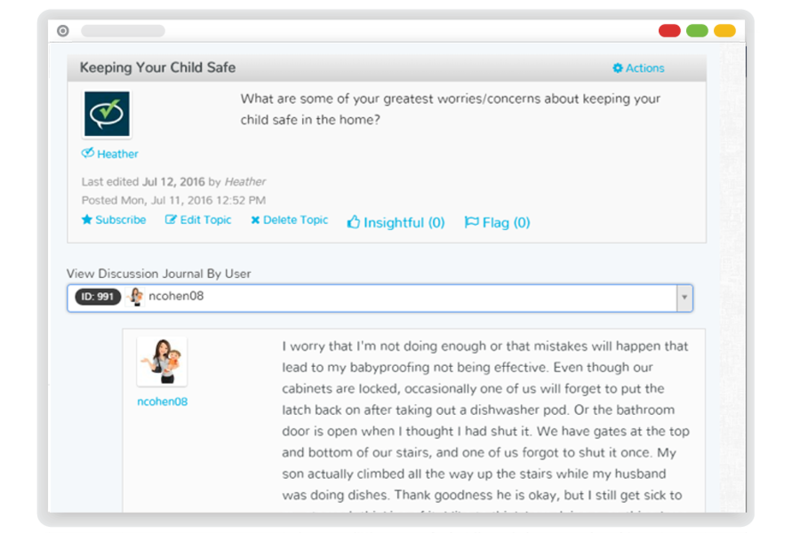 The My-Take moderator will monitor those responses and ask additional questions when appropriate. Chat Sessions are also a fantastic opportunity for members to interact with each other, encouraging community building. 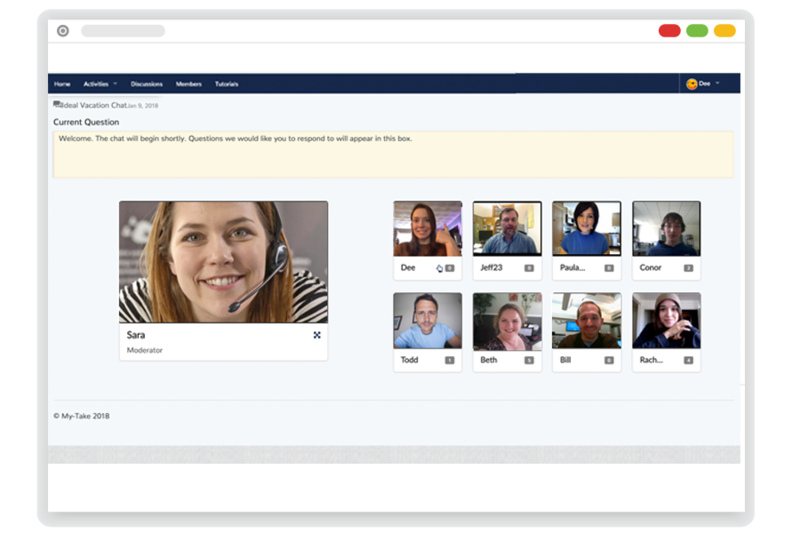 My-Take also offers live Video Chat. Video Chat Sessions offer the same level of interaction with members of the community with the added advantage of face-to-face interaction. 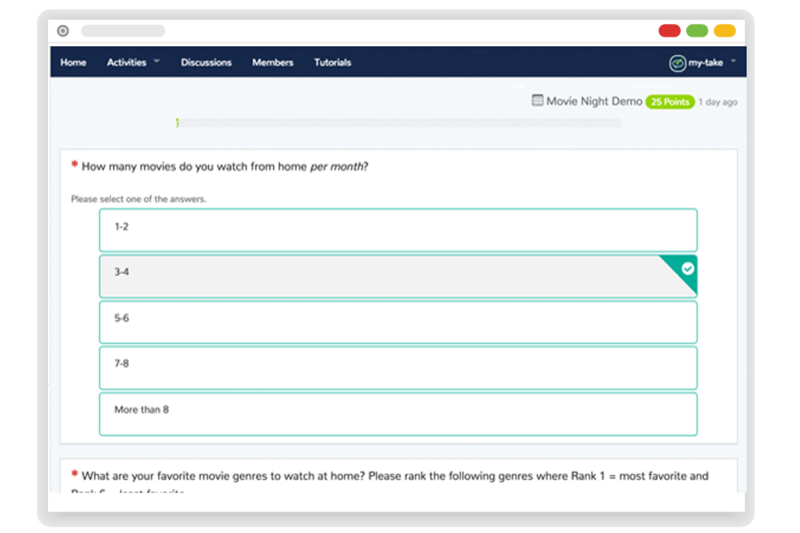 A select number of members are able to enter the Video Chat, and their discussion is moderated by a member of the My-Take team. In a Collage activity, we provide a series of images and a canvas, and members drag and drop the images to illustrate their feelings toward each item. Collages allow the company to gain a deeper understanding of the consumer’s thought process and let us see how different images affect perception of an idea. Topics are focused studies with a small group of consumers on a specific topic. 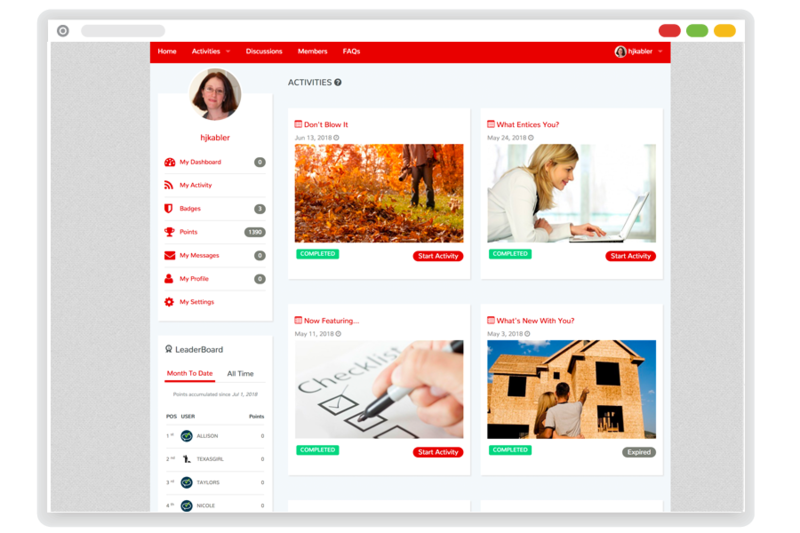 Members are able to interact with other responses on the message board and answer polls, surveys, and other question types. 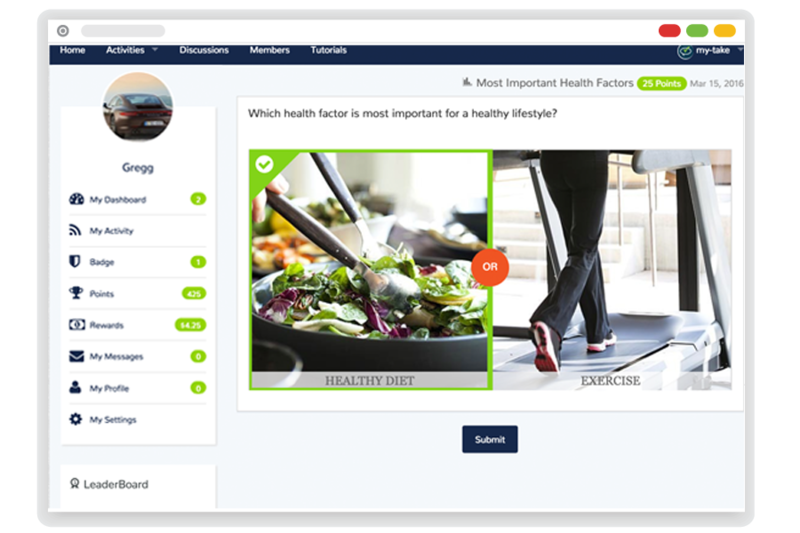 Topics also provide a module for the client, the members, and My-Take to interact, allowing for advanced moderation and control. The mobile Missions app offers the ability to secure unique insights by offering mobile specific activities. Missions supports multiple-step activities. 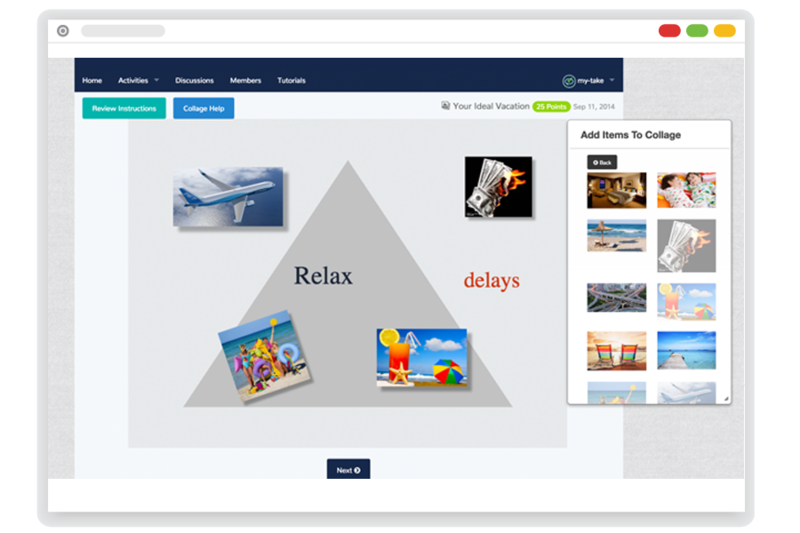 Video, voice and image upload, along with rating, open end, NPS, emoji, check-in, single choice and multi-choice. Integrated to back-end reporting dashboard.